Ceramics like this are now on display at Michigan Medicine. The Huron Valley Ceramics Collective (Isabella Comai, Dennison Dorsey, Sasha Guo and Margaret A. Miller) is a group of emerging artists who work out of the Clay Work Studio in Ann Arbor. 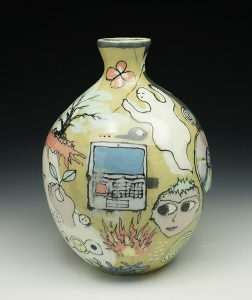 The works in an ongoing exhibit at Michigan Medicine are an expression of how the use of ceramics mediates daily life. For instance, the artists explore life and reflection through surface and narrative elements by using a combination of wheel thrown and hand built terra cotta, stoneware and porcelain. All faculty and staff can check out the works for themselves!